Vision therapy: Skills and porcupine quills! Stella's first time wearing therapeutic prism lenses. Last night and this morning, there was a nerve-wracking build-up to Stella’s check-up, wherein her developmental optometrist would gauge how patching and vision therapy have helped Stella, or not. I’ve worked very hard (okay, harder on some days than others) during Stella’s first three months of vision therapy, sometimes pulling my hair out, often swallowing pesky doubts, and occasionally guzzling wine. 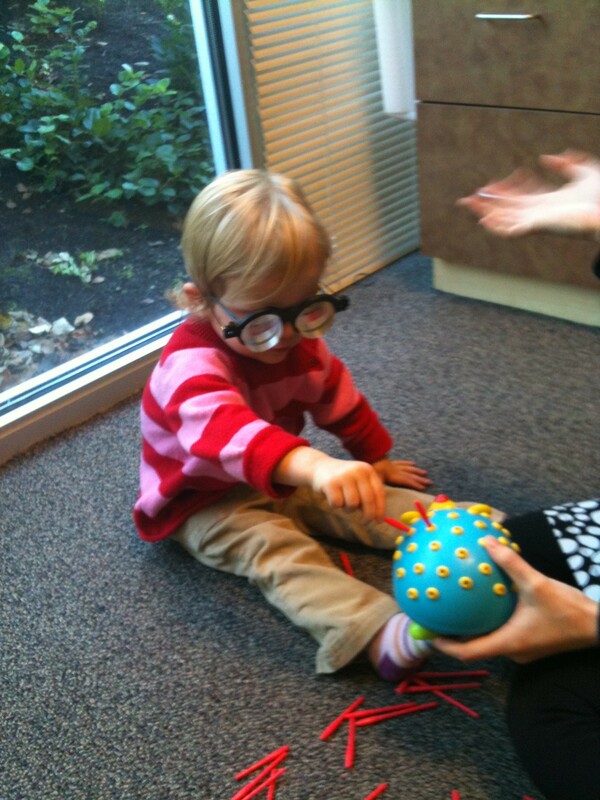 She’s 27 months old now, and has been such a trooper through glasses, patching and vision therapy. She asks to do certain “eye games” and requests her patch in the morning so she can watch a video (it’s her routine, plus there’s no TV watching without a patch). But she can also be impossibly resistant in that flippant, in-your-face way common to two-year-olds. And Stella’s not the only one with a short attention span! What was I talking about? Oh yeah–this isn’t easy, folks! I’m proud of Stella regardless, but has all our effort paid off? As we headed out to the doctor’s office, part of me was absolutely certain that yes, her progress has been hit-you-over-the-head obvious and will be decisive and documented for posterity in the history books (or at least Stella’s patient records). But, I’ll be honest. Another part floundered and secretly wondered if we’d been throwing away hundreds of dollars each month. The verdict: Stella has made solid improvement! Stella’s amblyopic eye is getting stronger and her eyes are working together more effectively. In August, when Stella was 24 months old and had been patching for maybe three weeks, her left eye was judged to be 20/40 [edit: found out at vision therapy that it was 20/80 before patching began]. Her right, 20/20. Since then, her left eye ramped up to 20/30, and her right is still 20/20. Other positive signs: During the exam, Stella’s eyes didn’t cross like last time. She showed much clearer evidence of 3D vision and binocular vision while wearing red/green glasses. These areas still need a lot of work, but Stella’s doctor and I see her first three months of patching and vision therapy as a success. 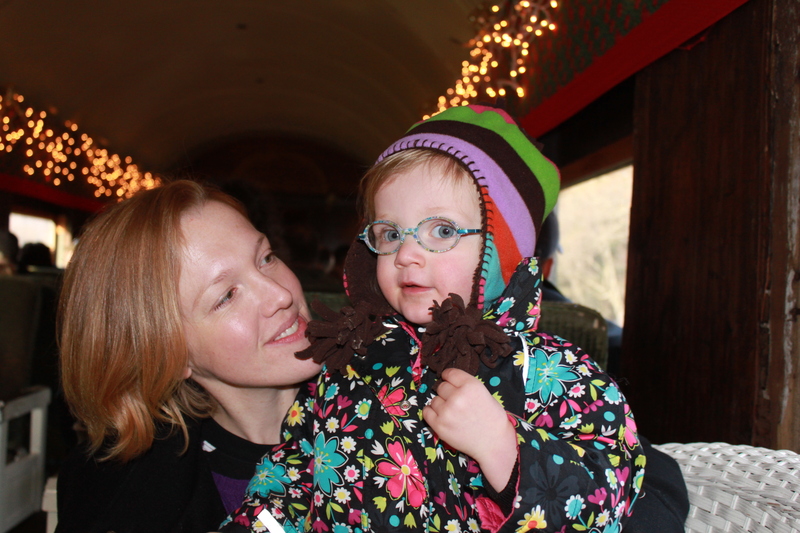 Stella and I, while riding the Santa Train. Happy holidays, everyone! Until our next exam, the patching (two to three hours a day with tape on the lens) and vision therapy will continue, with new aggressive efforts added in so as to encourage Stella’s bossy eye to play nice. I requested that the office give me more exercises to take home, even if just for a week at a time, to keep Stella more engaged and to ensure we’re making the best possible use of our at-home therapy time. The doctor completely understood and agreed. She said that with a patient Stella’s age, you need six exercises at hand in order to ensure that three actually happen. She’ll be meeting with our vision therapist to discuss all of the above, of course. In short, hooray! We saw progress! I’m pleased. But inexplicably, I feel a bit flat. I suppose it’s because there’s still so much hard work ahead. I knew that going in, but now it’s hitting me. Or maybe there’s this other little part of me, not previously admitted to, that was hoping for nothing short of amazing, miraculous results and 20/20 vision in Stella’s left eye. That’s the inner voice that gets me to persevere when, after Stella’s fifth evasive maneuver and tenth “no” of the afternoon, I feel like tossing the foam beads out the window and saying, “Screw it.” She’s tough. She gets me and Stella to those moments where new abilities are revealed, like when after much initial struggle Stella started loading up pipe cleaners with beads and scanning the room to quickly find hidden letters and smoothly snagging tiny bears off rotating discs. That optimistic side of me has enough to go on, and will hold on tightly for another three months. Let’s hope I don’t go bald in the meantime. Great news Amber! You both have made such progress. I know this can be very trying on your patience (this isn’t an easy age) but stick with it. Stella is so lucky to have you! Thanks so much, Alanna! At vision therapy I actually got more assessment and Stella’s progress is actually great, and we are now doing more progressive exercises. Very exciting. Thanks for the support! My 7-year-old has started vision therapy this year for mild amblyopia. Our therapists are very sweet, but have not been very forthcoming about specific therapy activities we can work on at home. Can you recommend any resources that we can use to set up an at-home therapy routine? Thanks!